New video “Velvet Cake” by northwest London rapper Da Flyy Hooligan, taken from his “F.Y.L.P.M.” EP released earlier this year. Produced by NCL TM, the beat blasts out a cacophony of brass and soul samples over which DFH gets creative delivering trademark dexterous wordplay and high calibre rhyme schemes. On the track title he simply states “When you’ve had the best red velvet cake from Lords Bakery in Flatbush, Brooklyn, you’ll understand why I named this jawn – definitions of deliciousness“. Da Flyy Hooligan’s new album “S.C.U.M.” featuring Westside Gunn and Hus Kingpin releases worldwide on CD and digital formats through Miami label 22 Entertainment on October 27th. UK online publication HHK Magazine have been running their “25 Facts” series for a few years now, a behind the scenes look at artists and their latest releases. Designed to provide some lesser known or even unusual information about the concepts or events which took place during the recording process combined with a rare insight into the artist themselves. Latest to be focused in this series is Long Beach’s Horseshoe Gang and their new album “Anti-Trap Music” which releases on April 29th 2016. Read the full feature HERE where among other things you’ll learn about the films, actors and entertainers they rate the most, they explain why they’ve evidently inherited some of their mother’s talents and how they started to rap from the age of 3, and speak on the Jason Vorhees v Freddy Krueger beef….! All international media, press and radio inquiries regarding Horseshoe Gang and the new album can be sent to us at UrbanElite PR. The CD version is already available to pre-order direct from the label. There are various packages on offer including signed copies and combinations with t-shirts. Click the LINK and take your pick. You will receive your order a week before the official release date. 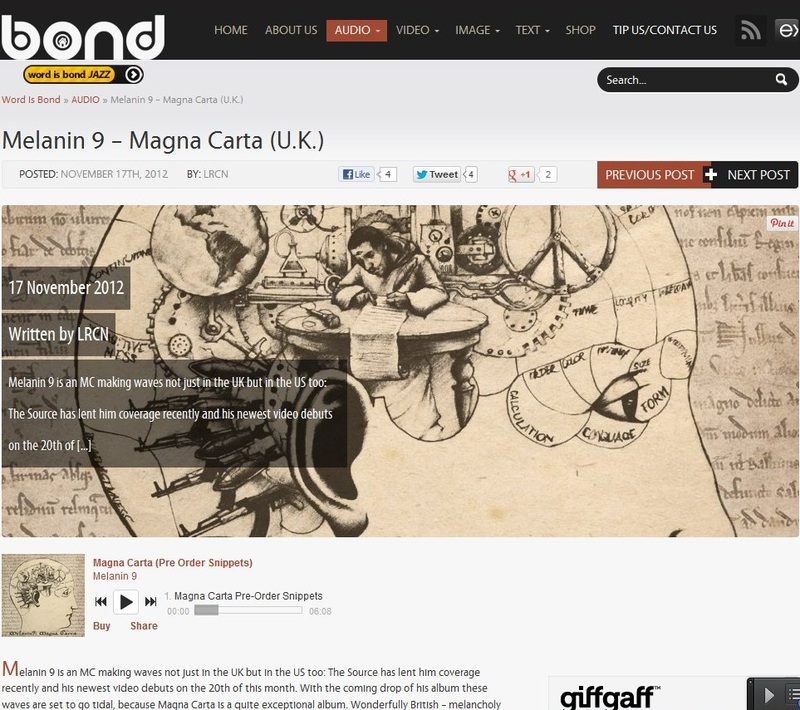 At that the beginning of what is going to be a busy week for London’s Melanin 9, international online “The Word Is Bond” are the latest to cover what they describe as “a quite exceptional album“. On Friday his album launch party takes place from 8pm – 1am at The Vibe Bar, 91 Brick Lane, London E1 (nearest tube Aldgate East). 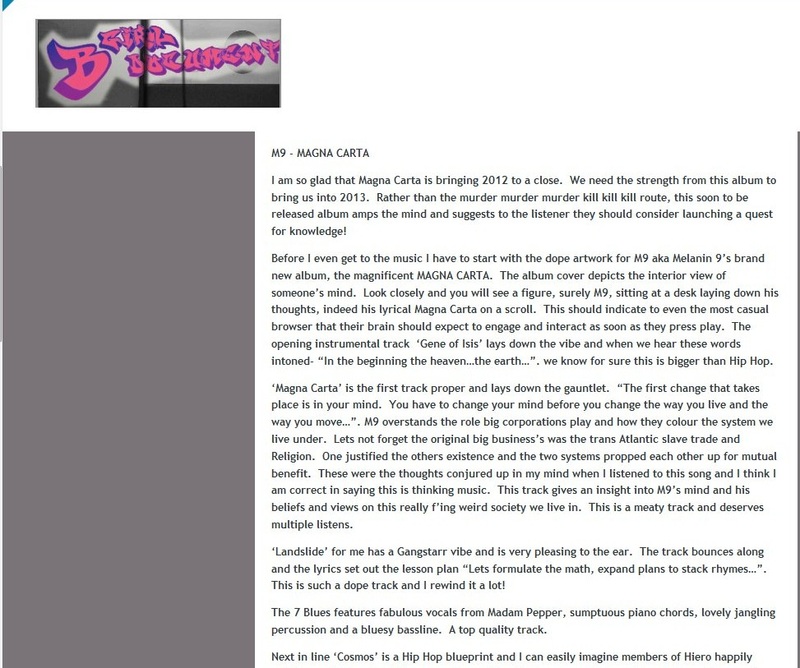 “If we had a Hip Hop university, Magna Carta would be a Rap dissertation” helps conclude the in depth analysis of the 14 track album which features Triple Darkness, Roc Marciano and Madame Pepper, with production from Anatomy, Jehst and Tony Mahoney. The review is another in appreciation of his lyrical content, wordplay and diversity of production. “Melanin 9’s honesty and lyrical prowess shines through, proving that with a fresh beat, deep lyrics and talented delivery, you can be as ‘conscious’ as you want. The message doesn’t detract from the music, and the music doesn’t detract from the message. 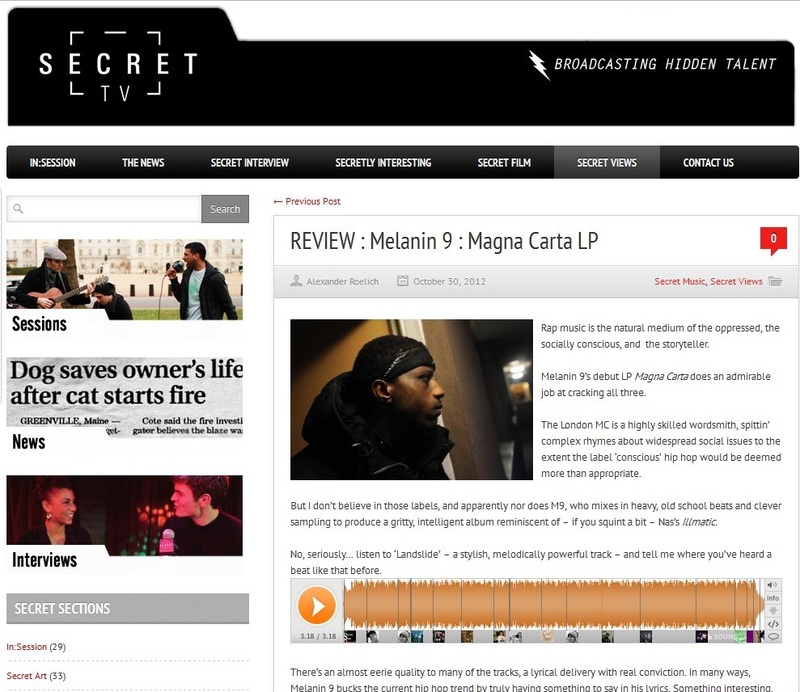 New single taken from Melanin 9’s new album “Magna Carta” which releases on 3rd December on Red Snow Records. His reputation for conscientious rhymes and intelligent wordplay has resulted in an ever growing fanbase in the UK and overseas, striking a chord with those who appreciate the “Golden Era” of hip hop. The new release Landslide, produced by Anatomy and cuts by Evil Ed, follows on from the launch of his recent video for Organised Democracy. 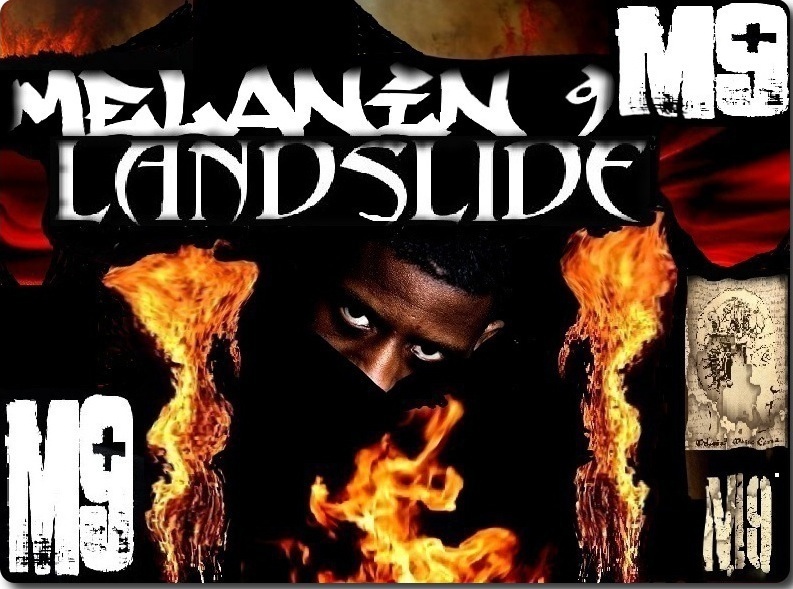 Look out for further special releases and media coverage over the coming weeks and months, as Melanin 9 also puts together final plans for his album launch at Vibe Bar in London on 23rd November to mark the release.